STS achieved HSE milestones of 15 Million LTI Free man-hours and 1343 LTI Free days on 17 Oct 2018 on its PDO EPCC-Nimr Contract. These achievements were possible with the commitment to safety and hard work by the entire team for more than 3 years. The team had efficiently managed the project delivery by keeping “GOAL ZERO” target and outstandingly sustained the safety standards while working on challenging environments like remote worksites and live facilities (Amal Production station, Nimr Production Station, Al Noor production station and other offsite facilities etc). This remarkable milestone, was marked with a celebratory event held at the project’s locations in Amal, Nimr & Al Noor Camps on 26, 27 & 28th November 2018 respectively. 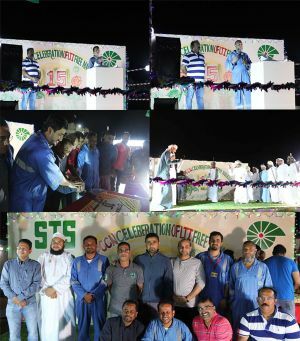 It was attended by STS Management team, PDO Senior management team, staff and contractors. PDO Senior management team termed this achievement as “A best in class performance and AMAZING business delivery ensuring safety of the Workforce and business Assets”. STS Management congratulated the entire Nimr team for their contribution to the “GOAL ZERO” objective and encourage them to continue in this line until the end of the project.